National Catholic Sisters Week is an annual series of events that instruct, enlighten and bring greater focus on the incredible lives of women religious. Taking place this year from March 8 to 14, National Catholic Sisters Week 2016 is offering 155 events in more than 25 states across the country. 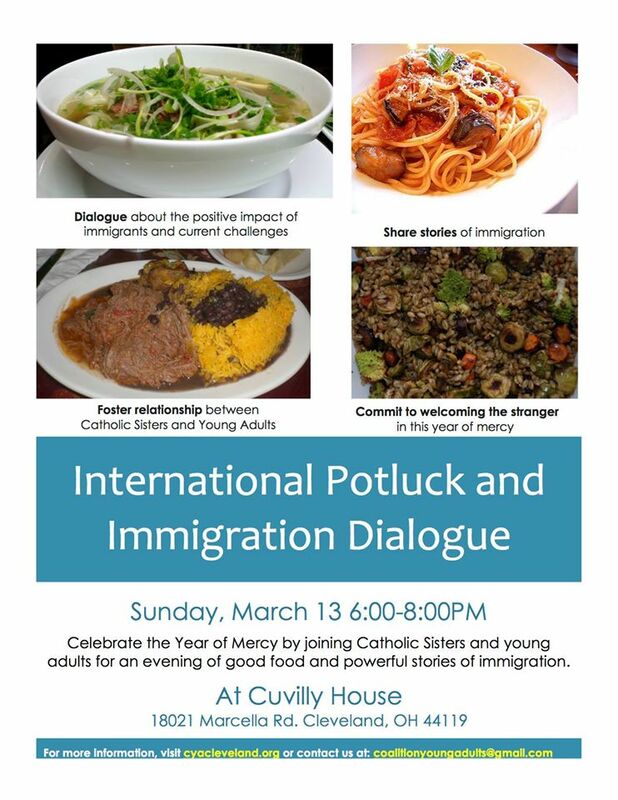 In Cleveland, one such gathering is the International Potluck and Immigration Dialogue event on Sunday, March 13, from 6:00 to 8:00 p.m. Hosted by the Coalition with Young Adults (CYA) in Cleveland, it invites community members to join Catholic sisters and young adults for an evening of good food and powerful stories about the positive impact and current challenges of immigration. The event takes places at Culvilly House, 18021 Marcella Road, Cleveland, OH 44119. Attendees are asked to register in advance by emailing coalitionyoungadults@gmail.com. Across the country, in addition to the many events, National Catholic Sisters Week is actively creating conversation on Facebook, Twitter and Instagram using the hashtags #NCSW2016 and #NCSWHere. National Catholic Sisters Week is supported by a $3.3 million grant from the Conrad N. Hilton Foundation; headquartered at St. Catherine University in St. Paul, Minnesota; and held in conjunction with National Women’s History Month. In 2014, the inaugural National Catholic Sisters Week featured a conference drawing more than 50 pairs of Catholic sisters and college students across the country to St. Catherine University and engaging hundreds more online, shining a national spotlight on Catholic sisters and raising awareness of their profound influence on young women. A highlight of the weekend was SisterStory, a storytelling event hosted by acclaimed broadcast journalist Soledad O’Brien and produced by The Moth Radio Hour, the national public radio show that won a Peabody Award in 2010. Today, SisterStory is the ongoing story of National Catholic Sisters Week. As a Catholic organization, the Sisters of Charity Foundation of Cleveland works to support the ministries of women religious, and extends the mission of our founders – the Sisters of Charity of St. Augustine.